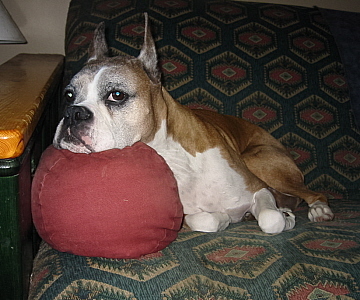 January 17, 2011 - Today Donna, Jalene and I said goodbye to our special boy Kosmo. Kosmo was only a few months away from his 12th birthday but unfortunately it was not meant to be :-( He has lived a good, long life and is the last of my first two litters to go to Rainbow Bridge. Kosmo lived with me until he was almost 2 years old and when I decided to place him, the Rode family came along and gave him a wonderful loving home :-) Kosmo lived for food and was known to make fingers bleed when he was shown even when he was brought out as a veteran! At home he was a gentle, sweet soul and great mentor to his nephew, Can. Ch. CynTech's Smooth Criminal (Rocky) for the 7 months they were together. Kosmo made his debut in the show ring, along with his litter sister, Can. Ch. CynTech's Ally McBeal DOM (Allie), on October 22, 1999, at the Northern Alberta Canine Association shows (Oct. 22-24), in Edmonton, Alberta, at just six months of age. Kosmo, like his sister, was a little overwhelmed, but did improve with each day of showing. On the final day of showing (Oct. 24th), under Canadian judge John Kearley, Kosmo went Winners Male for his first two points and Best Puppy In Breed! I was surprised, but very proud of his accomplishment, especially as it was his first weekend out! In his second weekend of showing, at the Red Deer and District Kennel Club shows November 5th to 7th, 1999, under US judge Janet Wilcox, Kosmo went Winners Male, Best Of Winners for three points and Best Puppy In Breed. Another incredible weekend for the both of us. In his third weekend of showing (and final show of that year), at the Calgary Kennel & Obedience Club shows November 26 to 28, 1999, Kosmo went Winners Male for one point under Canadian judge R. William Taylor and the following day under Canadian judge Leslie Rogers, Kosmo went Winners Male for two points. Kosmo, at seven months of age (as of his last show), is now on eight points towards his Canadian championship which were all owner/breeder handled! Needless to say, I am looking forward to having the same success in 2000! 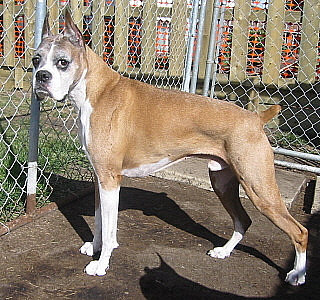 Kosmo goes Winners Male and Best of Winners for a three point win (owner/breeder handled) to complete his Canadian Championship at eleven months of age under judge, Ellis Hulme from England, on March 31/00, at the Red Deer and District Kennel Club show. Kosmo is the 2nd Canadian Champion for his dam, Malimi's New Debut For CynTech CD, ASCA CD (Am/Can. Ch. Ajay's Alfred Sung SOM X Can. Ch. Malimi's Sugar Plum DOM), and is the 7th Canadian Champion for his sire, Can. Ch. Berlane's Corporate Image (Multi BIS & BISS Am. Ch. Rochil's Grande Marshall SOM X Can. Ch. Rayshar's Summer Magic CD TT), making Max a Canadian Sire of Merit! Flash! Kosmo makes his debut in the Junior Handling ring with David Hammond at the Alberta Boxer Specialty on April 3, 2009. Dave and Kosmo received a 2nd in class placement in Junior Novice from Juniors Judge Crystal Davies! Dave then showed Kosmo in Veteran Sweepstakes and received a 2nd in class placement from Sweeps Judge Deborah Schenher. In the Specialty under Shirley Bell, Kosmo received a 3rd in class handled by Crystal Davies!